Since his rookie year in 2006-07, only one American-born player has more goals than Phil Kessel. That’s fellow Olympian Zach Parise, who has two more goals over that span than Kessel does. Since Kessel’s first 30-plus goal season in 2008-09, however, there’s not an American-born player within 20 goals of Kessel’s 181. The Wisconsin native is annually one of the league’s best goal scorers, potting 30 or more in the four seasons before the lockout-shortened 2013 season, in which Kessel poured in 20. This season, the Toronto Maple Leafs sniper already has 26 goals and is on pace for the first 40-goal season of his career. Right now he’s on a mini tear with five goals over his last four games. So, if you’re following along, Phil can score some goals. Perhaps one of the more misunderstood players in the league since his arrival, the typically quiet Kessel has endured an interesting existence in the NHL. After starting with the Boston Bruins, who selected Kessel fifth overall in, he endured the hype as “America’s Sidney Crosby,” being diagnosed with cancer during his rookie season and getting traded to the Toronto Maple Leafs in a deal which lived in infamy only until recently. The fact of the matter is, Kessel is one of the league’s elite goal scorers and he’s always had it in him to be that player and has been that player longer than most have noticed. He’s been a star on every team he’s ever played dating back to his youth, but because he might not give a great quote in post-game interviews and maybe doesn’t necessarily look the part, NHL celebrity status has evaded him. Kessel also has endured criticism most players of his talent don’t have to endure. He’s not defensive enough. He’s boring. He’s a bad teammate. He’s out of shape. He’s selfish. He’s a lot of things that he may or may not be to a lot of different people. It has always been something. Through it all, though, Kessel has kept scoring goals, while maintaining a pretty low profile off the ice. The Bruins seemed to be happy to be rid of him and Boston fans seemingly rejoiced in his absence. When Kessel came to Toronto, he had to play under the crushing pressure of a trade that was widely panned around the league. Brian Burke took a huge gamble in trading away his first-round picks in back-to-back years to acquire Kessel. Those picks became Tyler Seguin, the wonderfully talented youngster who similarly wore out his welcome in Boston, and Dougie Hamilton, who is still finding his way in the league. Kessel has scored 119 goals for Toronto in the five seasons he has been there and time may tell that Burke’s gamble was a good one as Kessel will remain a Maple Leaf for the foreseeable future. All in the face of fans and media continually questioning if what Burke did was worth it, if Kessel himself was worth it. For whatever reason, Kessel has never really gotten his due, but that is starting to change. With each burst of speed down the wing and each shot that rockets off the crossbar and in, Kessel is making a statement that he is one of the best offensive players in the game. A two-point performance in Vancouver in 2010 was underwhelming, but Kessel is in the midst of what could be the best season of his already distinguished career. At 26 years old, he’s still accelerating into his prime. In Sochi, Kessel has the biggest stage at the right time in his career to write a new chapter in a career that has been consistent in its on-ice success, but a roller coaster in perception. What he brings to Team USA: Kessel has the tools to succeed on the big ice. He has succeeded on the big ice with an international career from age 16 on in which he has averaged more than 1.2 points per game. With explosive speed, Kessel can beat defenders wide and his shot allows him to take it from just about any angle with a chance to score. Teams are going to have a hard time with Kessel in transition and if the defense manages to keep him wide, he won’t be afraid to take chances with his shots. When it comes to shooting the puck, Kessel’s release is among the best in the world and he’s deadly accurate. He already has 201 shots on target this season, which means he’s going to make goalies work when he has the chance. Kessel will also likely be paired with James van Riemsdyk, who he plays with in Toronto. Their built-in chemistry should make for a very talented second line. Kessel also played a fair amount with Joe Pavelski in Vancouver, which means there could be a really solid match for a center there. You get those three going well early in the tournament and they’ll be a lot tougher to stop. Kessel’s international career numbers are as good as anybody’s on Team USA. He is USA Hockey’s all-time leading scorer at the World Under-18 Championship and led the 2006 World Juniors with 11 points. More recently, Kessel posted 10 points at the 2008 Men’s World Championship, which was played on North American surfaces in Canada. Perhaps Kessel’s most relevant international experience came in 2007 at the Men’s World Championship in Moscow. He was a point-per-game player with two goals and five assists as Team USA finished fifth. Though his 2010 Olympics wasn’t a productive one, getting him back on the big ice is going to be extremely interesting. The U.S. needs its top two lines to score a lot of goals in this tournament and Kessel will be asked to shoulder a large part of that burden. Memorable USA Moment: Kessel’s brightest days in a USA jersey came in his younger years as he was busy helping the U.S. rack up some hardware at the U18 level. He played at the World Under-18 Championship twice and offered two of the most dominant performances by an American in a tournament in which the U.S. has excelled. 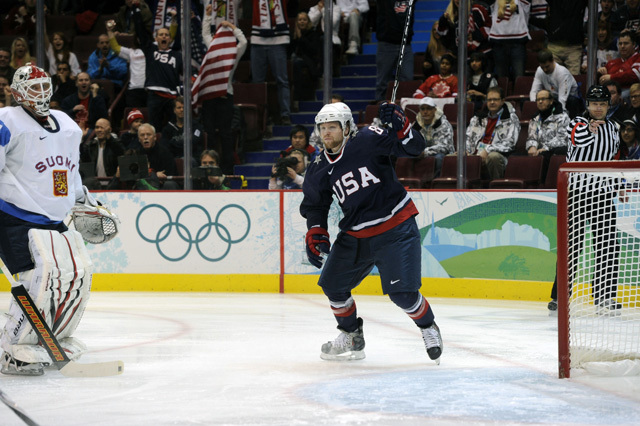 As a 16-year-old in 2004, Kessel helped the U.S. to the silver medal in Belarus with 10 points including seven goals. That really put him on the map as America’s answer to Canada’s Sidney Crosby. He was just doing some silly things at that point. Kessel topped himself the following year, however, and the results were great for both him and his team. At the 2005 World Under-18 Championship, Kessel posted a 16-point performance, still a U.S. record, as Team USA captured its second gold medal at that tournament. Kessel had eight more points than the next closest player — teammate Nathan Gerbe. His nine goals and seven assists both were tournament highs as Kessel was obviously named the tournament’s best forward. Kessel spent two years at the National Team Development Program in Ann Arbor before heading to the University of Minnesota. 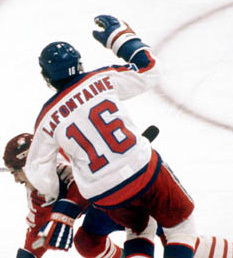 He left the NTDP as its all-time leading scorer with 180 points including 102 goals, both still program records. Kessel scored 52 goals in each season in Ann Arbor, with Patrick Kane the only other player to match that single-season mark. There’s really only one way for Kessel to top the success of his younger days with USA Hockey and he’ll have the best opportunity possible to do just that in Sochi.